Risers & Shakers: Using Your Influence for good! In the last few months, we've had a growing number of influencers ask about how you can help and want to get more involved in the work that MomsRising does to increase family economic security, decrease discrimination against women and moms, and to build a nation where businesses and families can thrive. We are hoping that this post will provide a jumping-off point as we move forward. This newsletter will evolve with time (and your input), and I sincerely hope it will become a go-to for you as you find your voice in this space. If you'd like to sign up to receive this in your inbox, feel free to sign up! Below, you will find general information, highlights from recent campaigns, some tips and tricks around blogging and social good, sample social media shares (because we know you want to help AND you're busy so we are trying our best to make this as easy as possible), and hopefully some treats along the way. It is my sincerest hope that this is the beginning of a long lasting relationship as we work together and raise our voices to make our country, and this world, a better place. Who said social media can't bring about change? Sad to say: Many members of Congress have ZERO idea of what families in our nation face with their health care need. This means that sharing our experiences can be a powerful wake-up call for them about the importance of not stripping health care access and protections. Think of this as the Give Congress a Clue Project! Even much of the public doesn't know that Medicaid is a critical program for low-income children and families, pregnant women, ederly people, and people who live with disability and chronic illnesses. We need to get the message out that cuts and caps on coverage for these vulnerable populations are unacceptable! 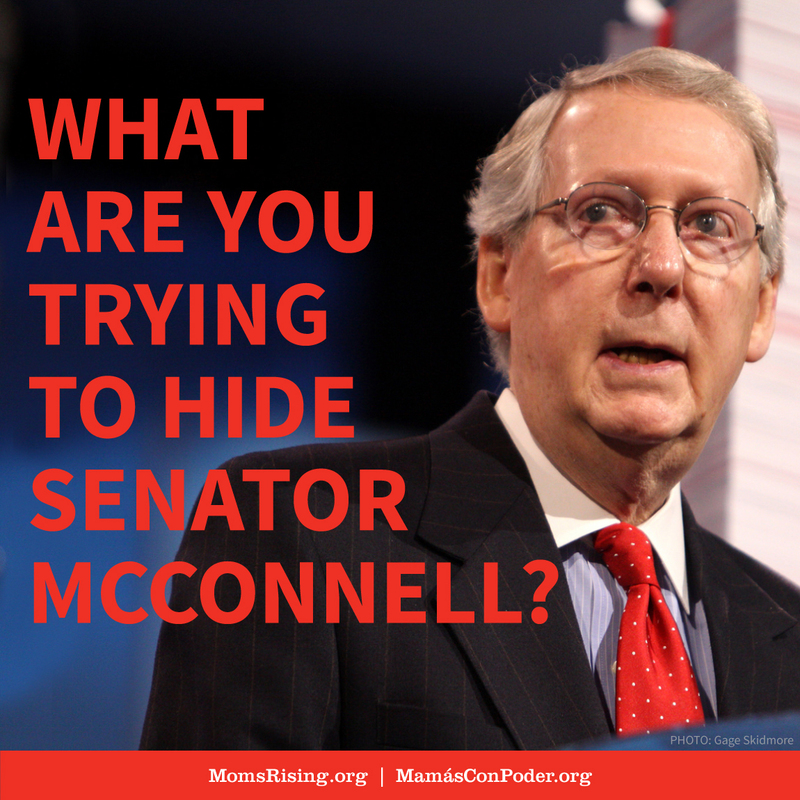 This week, we are putting in calls to Congress urging Senator McConnell to be transparent as he is refusing to hold hearings that would allow the Senate to hear from those who know health care best, including families who would be harmed by cuts to Medicaid and by the repeal of the Affordable Care Act! Click on the image below to download it and share with this number: 1-888-496-4842. And check out Five Ways to Be a Kickass Healthcare Advocate! if you'd like to find out more about how you can help! The Surgeon General recommends that children be exclusively breastfed for six months. That's difficult to do when 60% of pumping moms have no adequate time and/or space to pump at work. MomsRising and the Wong Doody ad agency are partnering to take a stand to ensure that pumping moms everywhere have adequate spaces to pump. We are spreading the word (with resources and general information) over at IPumpedHere.org. You can find social media shares and general information about the campaign in our toolkit. At MomsRising/MamásConPoder, we know the value of multilingualism in creating bridges for children in the early years. From raising our own bilingual children, being bilingual ourselves, or working in communities to strengthen dual language education programs, we are committed to celebrating language diversity. This is why MomsRising is launching its first ever bilingual parenting resource site! For more details and shares, click here. Momentum for paid family and medical leave is continuing to grow across the country, and that’s good news. The bad news is that the Trump administration’s “plan” for paid leave, as outlined in his budget, is fatally flawed: It would leave behind millions of Americans who need paid family and medical leave, places tremendous burdens on states and provides no sustainable funding to implement the plan, and would not help businesses. 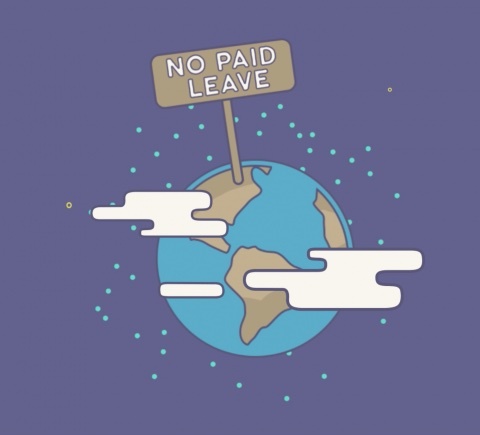 That’s why MomsRising is pleased to share this short, powerful, and creative 2-minute animated video that shows why paid family and medical leave is so important for families, businesses and our economy. Feel free to head on over to the social media toolkit for sample tweets and key facts. June is #ImmigrantHeritageMonth! Please join us as we celebrate immigrants and chat about our immigration stories. Let's lift up the contributions of all immigrants to the U.S.! Be sure to join us for the tweetchat on the 15th at 8 p.m. ET/5 p.m. PT with co-host Voto Latino. Greetings, influencers! As the editor in chief of MomsRising's blog, I want to personally thank each and every one of you who has published on the blog. From policy analysis to personal stories and more, you help to put a face on the policy priorities we fight for every day: health care, early care and education, gun safety, clean drinking water, immigration, and so much more. Keep up the great work! We will continue to promote your writing across our social media channels, connect you with readers who reach out to us with interest in your work, and connect you with each other. #KeepMarching and #KeepWriting! Senator Gillibrand shares on our blog her statement condemning Pres. Trump on the Paris climate accord. Patrisse Cullors, cofounder of the Black Lives Matter movement and Senior Fellow at MomsRising, shares tips to inspire you to take action now! Blogger Diana Limongi talks with parents about why dual language learning is so powerful and shares their words on the blog. Your work can be featured on our blog, too! Don't hesitate to reach out if you have questions about posting with us. Thank you! Are you going to BlogHer? Thinking about making it a last-minute trip and looking for a discount? Well, look no further! Make your way over to the registration page using our custom link and get $200 off your ticket! Tweet @ us to let us know you'll be there we can say hello! Want to know the inspiration behind MomsRising? Check out the Motherhood Manifesto documentary from the comfort of your own device! MomsRising has three tweet chats every week around some of our issue areas. These chats garner millions of impressions every week! If you have a moment, we hope you'll join us. #WellnessWed is a health-related chat hosted by MomsRising.org. The chat takes place most Wednesdays at 2 p.m. ET/11 a.m. PT and covers all matters of healthcare and health related topics from open enrollment, to mental health and beyond. National partners, organizations and individuals come on every week as guests to impart information and resources for our tweeters. #EarlyEdChat is a bilingual and weekly twitter chat hosted by MomsRising.org and its Spanish arm MamásConPoder.org. It's held every Thursday at 2pmET and covers all early learning issues from access to high-quality childcare to equity and quality in preschool. It generally attracts early learning advocates and organizations and parents. #FoodFri is a focused on all things food: access to healthy foods, healthy meals, food justice and a myriad of other topics that matter to moms and families. 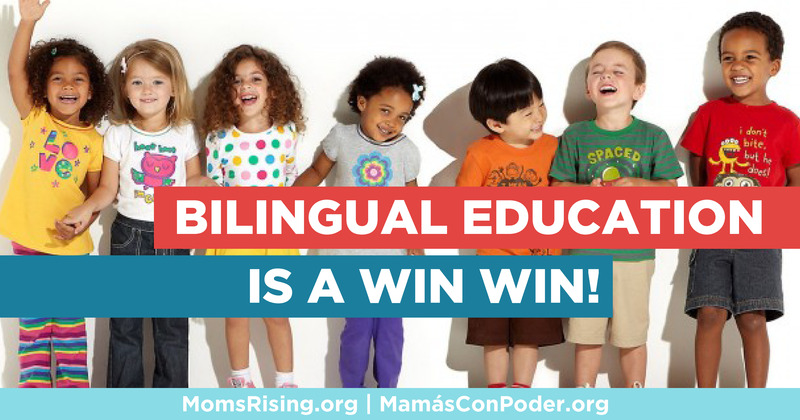 Did you know that @MamasConPoder is @MomsRising's Spanish speaking community? Join us today!